Treatment of an acid halide with diazomethane (CH2N2) followed by heating leads to the formation of a ketene which can be further used in many synthetic reactions. The Wolff rearrangement is a reaction in which an α-diazocarbonyl compound is converted into a ketene by the loss of dinitrogen with accompanying 1,2-rearrangement. This reaction contains two possible reaction mechanisms. It is not yet clear which of these mechanisms is correct. Common for both mechanisms is the production of diazo ketone that will act as the reactant in the Wolff rearrangement. 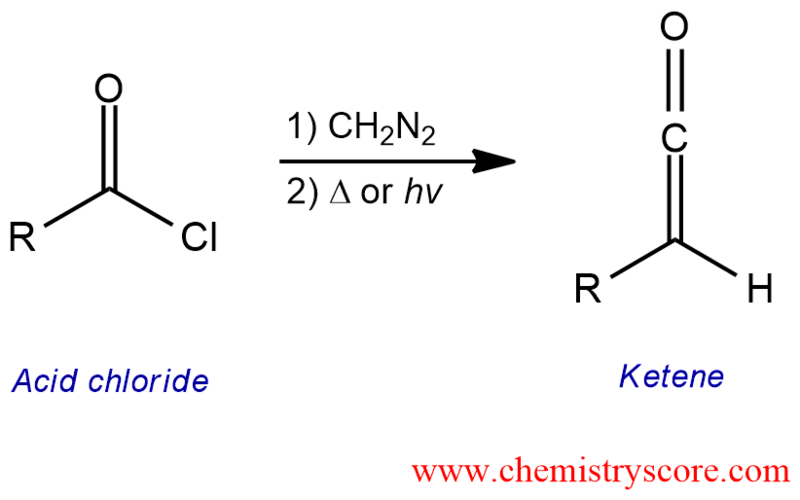 And diazo ketone forms in the reaction between an acid chloride and diazomethane. One of the resonance structure of diazomethane attacks the carbonyl carbon, the π breaks and the tetrahedral intermediate with a negative charge on the oxygen is formed. In the next step, the carbonyl group is reformed and the chloride ion is expelled as a good leaving group. Then, this chloride ion deprotonates α carbon and the diazo ketone which is stabilized by resonance is formed. Possible mechanism 1: If the diazo ketone is heated or placed under light, the carbon-nitrogen bond will break to form dinitrogen and ketocarbene. 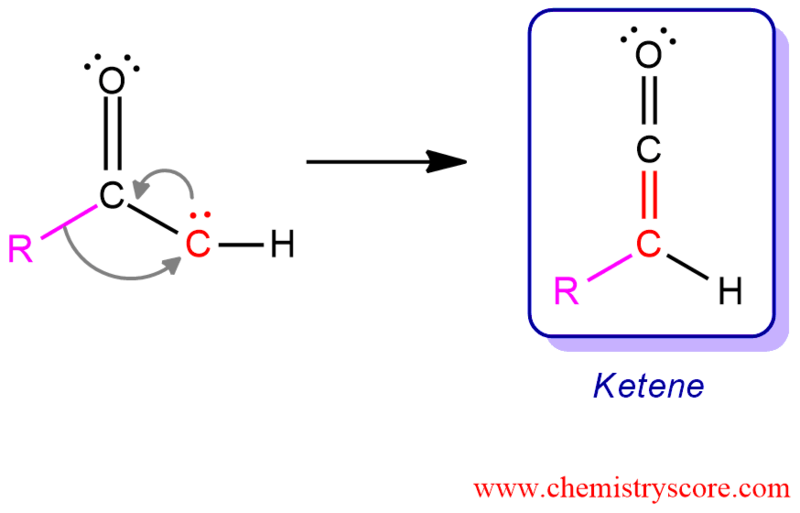 Ketocarbenes can either act as Lewis bases or undergo an intramolecular reaction called Wolff rearrangement. Possible mechanism 2: Everything happens here at the same time avoiding the step of producing carbene. The Wolff rearrangement yields a ketene as an intermediate product, which can undergo nucleophilic attack with weakly acidic nucleophiles such as water, alcohols, and amines, to generate carboxylic acid derivatives or undergo [2+2] cycloaddition reactions to form four-membered rings.